As a parent, it’s difficult for me to watch my children struggle with the small hardships that they face. I know my kids don’t deal very well with a poor grade on a test, or not making the team, or even not getting their choice of family vacation. What keeps me up at night is wondering, “What on earth will they do when real change happens?” The real world is coming quickly, and I struggle with teaching my kids to learn from difficulty and not be consumed by it—in short, how to have resilience. Expert psychologists and leaders in child development are all talking about the benefit of resiliency skills in children, how to build these skills in yourself, and what resilient people all have in common. The fun part for me is figuring out how to grow this ability in my 10-year-old. Because the bottom line is, you can’t just teach a kid to be resilient. I can’t just tell my sobbing child to accept her bad grade with grace and watch her magically move on to do better next time. I want my children to grow up able to keep from falling apart when they lose a job, to bounce back from bad relationships, to allow themselves to be vulnerable with those close to them. Unfortunately, what I want is a far cry from where they actually are. Instead of lecturing myself silly to try to get them there, I’ve made it a point to expose my children to difficult experiences that offer opportunities for growth. I do my best to constantly present them with new challenges, and our family discussions help sort through the difficult emotions together. Keeping things in perspective. It’s certainly humbling to realize how small you are when you’re sleeping out under the stars. During overnight camping, not only are there no tweets—there are also no toilets, no electricity, and no running water. Removing all the comforts of civilization, even for one night, is a sobering learning experience that forces kids to remember that the world does not revolve around them. Realizing your small place in the world puts your daily challenges into perspective, and allows you to “bounce back” from them with less emotional stress. Developing basic spirituality. 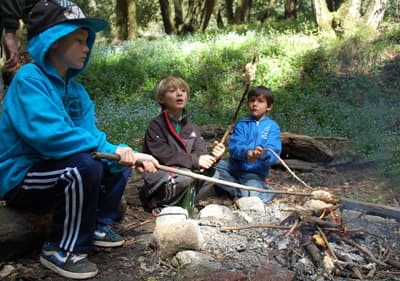 Activities like Outpost also give my kids the beginnings of a spiritual connection to the natural world. Spirituality, in this case, has little to do with religion and everything to do with a healthy emotional life. Hearing the screech owls crying in the night, wading barefoot among tadpoles in the creek, and feeling the wind drifting through the redwoods, you can’t help but feel connected to it all. A spiritually-connected life gives us an emotional boost to propel us above the daily challenges we face. Becoming more self-reliant. My daughter, coming home from camp this summer, ecstatically announced that she had successfully learned how to start a fire without matches during her camping night. She beamed from ear to ear as she described how she accomplished the feat, so proud of herself that she hardly even needed my affirmation. It was a good reminder, that by sending my kids to a camp that offers an overnight outdoor experience, I’m helping them realize that they don’t always have to depend on a parent or a teacher. These skills go on to assist you when real-world challenges come knocking. Researchers who studied workplace adversity found that personal resilience strengthened employees against hardship. Heavy workloads, bullying, organizational challenges, and a lack of autonomy were identified as challenges for nurses in this study—but frankly, these sound like the same challenges faced by students entering high school or college. The good news is that the same strategies my kids gained from Outpost—perspective, spirituality, and self-reliance—were found to increase the job success of participants in the above study. By using these strategies in their daily work, they tackled the challenges and were able to create even more positive outcomes than before. In my older daughter’s life, this looks like her receiving a ‘B’ on a math test and deciding to attend after-school tutorial sessions instead of performing her usual angry crying fest. Bingo. If you’re excited about having your child join in on the summer camp tradition, consider reaching out to Kennolyn Camps today. We offer day camp and resident camp programs for kids entering grades 1–12, and we are committed to offering children real opportunities to discover their strengths and to develop resilience.